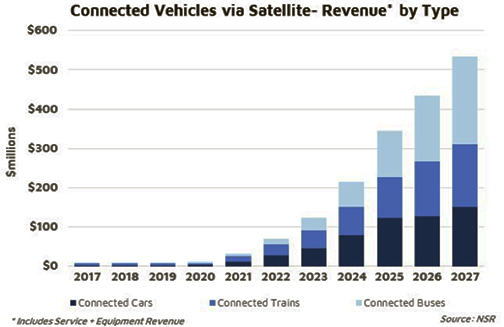 There has been significant industry focus on the connected car via satellite, and whether satellite can have a significant role to play with private and government vehicles. However, what is oftentimes missing from the debate, is the prospect for connected trains and buses to be served via satellite. While the broadband connected car will present opportunities, NSR believes the prospects for revenue growth of broadband connected buses and trains is a surer bet than it is for connected cars, with a captive end-user audience, a clearer business case, and lower price sensitivity. NSR’s recently published report, Land Mobile via Satellite, 6th Edition, found total retail revenues for connected vehicles in 2027 will exceed $650 million, with 32 percent driven by trains and 45 percent by buses, indicating significant demand driven by intercity passenger journeys. Nearly half of this is derived from equipment revenues, signifying a large ground segment opportunity in this market, which will be almost entirely captured by flat panel antenna (FPA) manufacturers and associated hardware and installation. With that said, there several technical challenges (in the short term) that need to be solved before long term growth can be experienced, and a connectivity ecosystem to be developed before widespread adoption of satellite technologies in buses and trains – each of which have some differing issues and prospects. A number of train operators have installed satellite internet connectivity for passengers’ enjoyment, including Renfe in Spain and SNCF in France. Others have been more hesitant, but have trialed the technology, including Amtrak in the U.S. and Indian Railways. However, there are several technical challenges that have slowed adoption; train vibrations have caused significant issues and thus have received complaints from customers while on satellite connectivity, with the difference in performance between satellite and cellular bonding very noticeable to passengers. Technical issues also include wires, cables and other infrastructure above the trains that complicate installs and interfere with the vehicle. This is in addition to the technical environment caused by high speeds, which can result in great difficulty in obtaining a fine-tuned solution. Further, the monopoly on rail transportation in some regions can result in competition not being a significant driver (unlike buses and aviation), for newer innovative services, including in-train satellite connectivity. However, new, lower cost electronically steered flat panel antennas on the horizon will help solve most of these issues and enable connected train opportunities to expand ramp up in the 2022 timeframe. These can simplify installation, reduce maintenance costs, and be installed in a broader range of trains across a broader range of operators and countries. These types of FPAs will have a huge impact on this market but will have a greater impact on connected buses. While impact will be greater, buses are not expected to use SATCOM connectivity for in-vehicle internet until later, compared to trains. This is for several reasons — most notably, the lack of engineering teams within many bus operators. This will result in a delayed level of implementation compared to trains. Bus operators, unlike trains, cannot afford to have a team looking into antennas (mechanically steered in particular) now and again, and this is critical to understand when forming solutions for bus operators compared with trains. Not only can buses operate in more places compared to trains, but competitive forces will be expected to grow the bus market longer term. 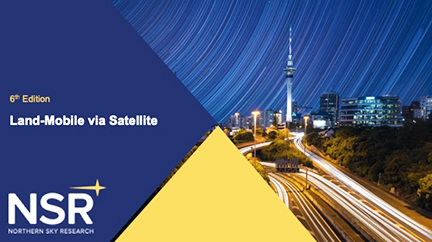 Hispasat, through a partnership with Phasor, have realized this and are trialing connected buses in Latin America, where long distance, intercity bus travel is the norm. Much like the commercial aviation market, passengers will make purchasing decisions based on access to in-bus connectivity. With a significant portion of intercity bus travel outside of terrestrially connected areas, satellite is ideal to serve such vehicles. Further, should FPAs become low cost and ARPUs priced competitively with terrestrial networks (most notably cellular bonding technologies), there is room for significantly more growth than the 24,000 connected vehicles NSR expects in 2027. Connected buses and trains matter to satellite and are worth the time to invest in, due to their widespread use, the lack of terrestrial alternatives in many cases, and the desire for travelers stuck in cramped seats to access internet to be entertained during what would otherwise be downtime. However, electronically steerable FPAs are critical to growth of the segment and investing too soon in sub-par solutions will ultimately be a waste of resources. Laying the groundwork in the meantime before offering compelling solutions combining lower cost FPAs, LEO-HTS constellations, pooled bandwidth plans, and nailing down subscription offerings are core prerequisites to successful product offerings and to be a part of the accelerating revenue opportunity post-2022 within connected vehicles.